If you don’t have anything useful to say on a screen or a sign, just turn it off. Or in this case, maybe show a big arrow facing towards the location of useful screens instead of trying to describe them vaguely. Airports (even if subway maps are cooler) are a very interesting area for user-friendly design, due to the busy schedules, complicated logistics, mass of very short-term users and — above all — overwhelming amount of information on those. 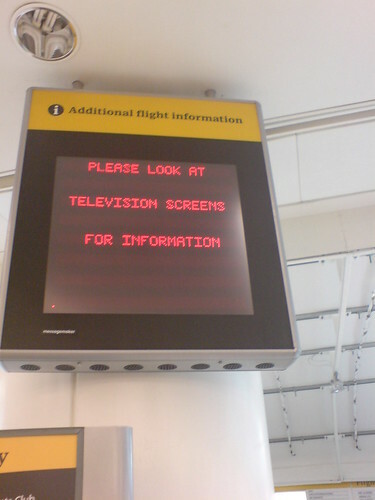 Apparently there are about a million web pages talking about “airport signs usability” alone out there.